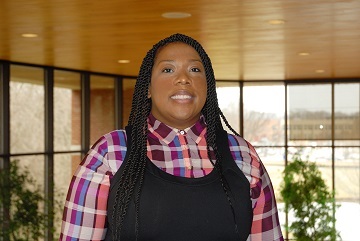 Rachael Falu, an assistant professor of English at Chattanooga State Community College, was named as a 2017-2018 Maxine Smith Fellow by Tennessee Board of Regents (TBR), following her nomination by Chattanooga State’s President Dr. Rebecca Ashford. Employed by Chattanooga State for the last seven years, Ms. Falu has made significant contributions to the Humanities and Fine Arts Division. In addition to her solid teaching skills in English composition, she also is adept in teaching English as a Second Language (ESL) and African-American Literature. During the fall 2017 semester, she developed an Honors section of African-American Literature for the Global Scholars Honors Program. The course focuses on ‘Revolutionary’ Writers from the early 18th century until present day. It included a field project where students worked with the curator and director of the Bessie Smith Cultural Center. The course offered an integrative experience by considering key facts of African-American Literature within the canon of American Literature. Ms. Falu also serves as coordinator and faculty sponsor for Chattanooga State’s Alpha Beta Chapter of the Phi Theta Kappa Honor Society (PTK), and is involved in various global and international initiatives at the college. “Rachael has done an excellent job revitalizing Phi Theta Kappa and developing the Global Scholars African-American Literature class these past five years. She is a champion of diversity and is passionate about having a diverse body of students and faculty on campus. She possesses good people skills and students respond well to her instruction, mentorship and guidance,” said Darrin Hassevort, dean and associate professor of Humanities and Fine Arts at Chattanooga State. In 2014, Ms. Falu was chosen to teach a South African/African-American Literature course for three weeks in Cape Town, South Africa through the Tennessee Consortium for International Studies Program. The TnCIS Program is a program that was formed by TBR that represents 19 colleges and universities devoted to making international education and cultural understanding a central goal of higher education throughout the state of Tennessee. While in Cape Town, 25 students and three professors were immersed in the culture. The students enrolled in the course were given the opportunity to focus on the life, legacy, and curriculum pertaining to Winnie Mandela as well as a glimpse of the larger climate in South Africa whether it was socio-political, economical, educational or racial. In the next five to ten years, Ms. Falu sees herself serving higher education in whatever capacity she is needed. She believes that higher education leadership should be transparent, collaborative championing of inclusive excellence, and have an unyielding commitment to student success. “In my leadership philosophy, I aspire to cultivate students’ profound thought and self-discovery. With any self-discovery, there has to be an aspect of research, whether intentional or coincidental. I immensely revere this process. Research is to seek for the truth. It takes time and persistence. For me, research provides a challenge and a thrill,” said Ms. Falu. Ms. Falu says that quality education is a citizen’s greatest asset and the best way for society to establish equity among diverse groups. She also believes that educational institutions ought to provide the best possible learning atmosphere in a diverse environment that cultivates and strengthens that setting. “As a Maxine Smith Fellow my goal is to assess the diversity within higher education and I look forward to the research project in which I will have the opportunity to share and collaborate with diverse professionals in order to create lasting outcomes that will enrich our institutions,” said Ms. Falu. The Maxine Smith Fellows Program was established through the Geier desegregation lawsuit to provide career opportunities for African-American TBR employees. Its purpose is to identify future senior-level leaders, pair them with mentors and provide them with opportunities for them to develop important leadership competencies. The ideal candidate is an exemplary employee who understands and is engaged in work that has a wide impact upon the institution. He or she must be a member of an underrepresented minority group based on representation at the faculty and senior administrative ranks, must be engaged in a leadership capacity at the institution, committed to attendance at all program activities while being an enthusiastic participant. The participant must have also obtained a Master’s degree or higher. Only individuals nominated by the president of the institution will be officially considered for acceptance into the program. This year’s program began in November 2017 and is scheduled to run through June 2018. All of the meetings are held in Nashville. “I believe that because of her passion to continue to support globalization and diversity initiatives today, her teaching abilities and the ability to lead make her an excellent candidate for the Maxine Smith Fellows Program,” says Mr. Hassevort. Ms. Falu joins eight selected nominees for the 2017-2018 Maxine Smith Fellows Program from around the state, including: Nikita Ashford-Ashworth, director of Advising Academic Support at Southwest Tennessee Community College; Melva Black, assistant professor of Communication at Volunteer State Community College; V. Latosha Dexter, deputy university counsel at University of Memphis; Cerrone Foster, assistant professor in the Department of Biological Sciences at East Tennessee State University; Thomas Graham, director of Emergency Management at Tennessee State University; Jyuana Martin, lead instructor–Aesthetics Technician at TCAT Nashville; Sidney-Anthony McPhee, Smyrna Student Success Center director/completion coach at Motlow State Community College; Joejuana Morton, grants specialist at Cleveland State Community College; Dannelle Whiteside, general counsel and secretary to the Board at Austin Peay State University.